Method: Combine 1 1/4oz Grey Goose Vodka, 3/4 oz Monin Passion Fruit Syrup, 1 Fresh Strawberry cut in four and 2 Fresh Basil leaves into an iced cocktail shaker. Shake and strain with some ice into a chilled martini glass. 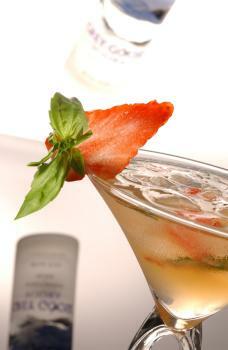 Garnish: Half strawberry and fresh mint. Method: Build over ice 1 1/4oz Skyy Vodka and 1oz double crème de cassis de Dijon into a tall glass. Then top with Schwepps Club Soda. 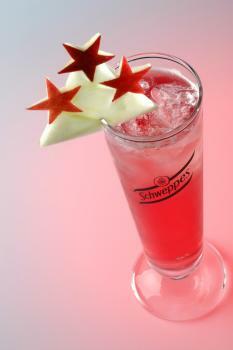 Garnish: Star of red apple inscruted in a triangle of green apple. Method: Combine 1oz Grey Goose Vodka, 1/4oz Kahula and 3/4oz Giffard crème de peche de vigne into an iced cocktail shaker. Shake and strain into a chilled martini glass. Then whip 1oz of liquid cream and pour it on top of the cocktail using a bar spoon. 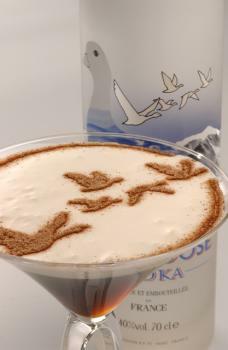 Then place a stencil over the drink and sprinkle with cocoa powder. Remove the stencil and serve like this. Enjoy.